Ankle injuries are some of the most common injuries in soccer, but fortunately, there are many different options for braces that can help get you back on the field as soon as possible. 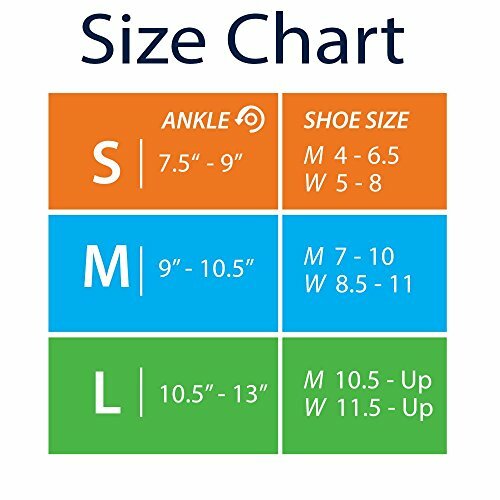 However, the vast selection also makes it a little difficult to know what the difference is between them, and exactly what ankle brace is best for your particular needs. We hope our reviews of the best soccer ankle braces helps guide you to choosing the proper ankle brace for your needs. We have also highlighted 5 of the ankle braces in the table below in more detail, with the associated detailed information found just below the table. After that, please check out our general info on soccer ankle injuries in case it can further help your understanding of different ankle braces. Good all-around lace-up ankle brace. Thinner material than some other comparable models makes it better for soccer. Increased performance comes with slightly decreased durability. This Adidas ankle brace provides average-good support (stronger than tape), yet very lightweight and not too thick. Great to wear in cleats, ideal for soccer players looking to reduce risk of injury. The ASO Ankle Stabilizer is one of the most popular ankle braces among athletes in general. Good all-around value, but high ankle strap may affect performance in cleats. This rigid hinged brace provides great ankle support and protection from injury while still allowing ample movement. Great for athletes, not so great for all-day daily use. This lace-up style ankle brace is excellent for soccer players who just want a little added ankle support, but have already returned to activity and need to maintain performance. Not the best for initial stages of injury. A highly popular ankle brace, the McDavid 195 offers great support and protection with a comfortable fit. A little beefier, so may not be the best under cleats if you're prioritizing performance, but can be good when initially returning to activity. These compression socks provide minimal protection from ankle sprains, but are great options for chronic issues like tendonitis or plantar fasciitis. They fit great under cleats. The Nike ankle shields are NOT meant to prevent sprains as much as protect from cuts and bruises (e.g. from another player's cleats). They are very lightweight and serve their purpose well. These Nike ankle sleeves provide minimal added stability, but offer compression and slight support. Great for everyday use, chronic foot conditions, or those who just want a tiny bit of added support. Similar to the Active T1 ankle brace, this rigid hinged brace provides excellent support and stability while still allowing movement in flexion/extension. Very popular among athletes who need to reduce risk of ankle injuries, including high ankle sprains. Please consider our expanded thoughts and detailed info about 5 of our favorite ankle braces from the table above. Please keep in mind that you should always check with a doctor or physiotherapist about what type of injury you have, and what type of ankle brace may be best for your needs. As you may have guessed, Adidas markets this ankle brace directly to soccer players, but it can be used within many other sports as well. The design is almost a hybrid between a compression sock and a lace-up ankle brace, whereby you get more stability and support than what's offered by a traditional compression sock, yet it's less robust than a lace-up ankle brace, allowing for a better fit under your cleats. The Adidas Adizero soccer ankle brace features a reinforced lateral protection design to help prevent rolling your ankle. The top strap is a traditional hook-and-loop closure, and we like how thin the strap itself is, as this minimizes the amount of material that is involved in the brace, promoting a more natural feel while on the pitch. Adidas claims that this brace is 3x stronger than traditional athletic tape, but you still need a nice tight fit in order to ensure maximum protection. One underrated feature of this soccer ankle brace is the anti-slip friction zones to prevent the brace from sliding around in areas where there is potentially lots of movement between the foot and the material. It's also made with moisture-wicking and odor-resistant fabric, which has basically become standard recently, but it's still a nice characteristic. Overall, this is an excellent ankle brace for soccer players or anyone else who needs something that can fit well under their shoe without being overly restrictive. On that note, this brace is not meant to be worn following a severe ankle injury, such as a sever ankle sprain. It offers more protection than a standard compression sock, but lace-up ankle braces, and definitely ankle braces with rigid bilateral hinges, offer more protection suitable for more severe ankle injuries. Therefore, if you're simply looking to reduce your risk of ankle injury during soccer, but aren't rehabbing from a knee injury and don't need the exceptional support offered by something with a more robust design, then we would definitely consider the Adidas Adizero soccer ankle brace. The ASO Ankle Stabilizer is a lace-up ankle brace that provides more support than an ankle compression sleeve. It's slightly bulkier than an ankle compression sleeve, but it can still fit comfortable under running shoes and cleats, and given you receive a lot more support than a standard sleeve, it's actually a great balance between comfort and support. Depending on the nature of your injury, the ASO lace-up ankle brace could be a good option for athletes who are in the process of rehabilitating an ankle injury, or for those with a history of ankle injuries leading to more overall joint laxity. It provides support in all directions, more so against twisting and eversion/inversion, and the straps can be adjusted to provide customized support. It should be noted that the material is not rigid, and therefore the side supports are not considered hinges. Thus, these lace-up ankle braces cannot fully prevent excessive motion due to jarring movements, but are definitely stronger than a compression sleeve. If you are unsure about how much support you need, or if you aren't fully confident in returning to activity, we definitely suggest talking to a physician or physical therapist before using one in your return to action. Overall, the ASO ankle brace is a great option for soccer players in the process of rehabbing an ankle injury, or any later stage of injury recovery. It can be worn under cleats, but the material is slightly thicker and provides more all-around coverage, so you may find it hinders performance, particularly when it comes to actually kicking the ball. Therefore, this ankle brace could still be great to wear during practice if you are just coming off an injury, but if you are fully healed and need something for an actual game and are prioritizing performance, you may benefit from something a little less robust. The Mueller Soccer Ankle Brace is a really interesting ankle brace designed specifically for soccer players. It's a great option for those healthy enough to return to playing actual games, as it provides support in only the most necessary areas. If you read our review about the ASO ankle stabilizer above, you can consider this Mueller soccer ankle brace to be the next in line in terms of progression through injury recovery. The Mueller soccer ankle brace is a lace-up style ankle brace, but you will be hard-pressed to find another ankle brace with as little material as this one. Mueller intended this brace to be worn under cleats while still allowing for a good kicking motion and without disturbing the natural impact of the foot on the soccer ball. The main disadvantage to this design is that it is slightly compromised in support when compared to other lace-up ankle braces, but it still hits the key areas where the most commonly sprained ligaments are, and it does offer a noticeable level of support. Additionally, if you are wearing this brace a lot while playing soccer, the thin material and lightweight design inherently lends itself to reduced durability, but it's definitely not a deal breaker, especially considering it serves its purpose very well. Overall, this is a great ankle brace for soccer players who are ready to return to action, but want the most support they can get without compromising performance. Again, to be clear, standard lace-up ankle braces usually offer a little more support, but the Mueller is most likely to fit well under your cleats and not disturb your kicking motion. You will likely notice it while wearing it, as it is supposed to help restrict motion in certain directions, but it's arguably the best you can get in terms of performance for this classification of ankle brace. This Nike Pro Combat Ankle Sleeve is essentially a very athletic compression sock with a very targeted region. This Nike ankle sleeve is made from lightweight and stretchy Ariaprene material that provides compression to the foot and ankle. These types of ankle sleeves are usually best suited for those with chronic ankle injuries, such as tendonitis or plantar fasciitis. They are known to help reduce chronic pain and inflammation, as well as enhance general comfort, but they only offer minimal support when it comes to protection from ankle sprains. Ankle compression sleeves like this Nike version generally offer the lowest amount of support among all ankle braces. That isn't to say the support is non-existant, but rather, they won't help protect your ankles from things like aggressive slide tackles or jarring ankle rolls. They may help to prevent or reduce damage from very light ankle rolls, but aside from that, we wouldn't look too much into the support/protection capabilities of the Nike Pro Combat ankle sleeve. Aside from athletes who suffer from chronic foot or ankle injuries, many individuals in the general population have also found this Nike ankle sleeve to be highly beneficial. This thin ankle brace can be worn all day and under any type of footwear with ease. It's comfortable, breathable, and easy to put on and take off. For example, lots of golfers and hikers find this to be a great item to help reduce pain and inflammation from long activities. Overall, the Nike Pro Combat ankle sleeve is a great option for anyone who needs just a little added ankle support, either during activity or for daily use. It's great for chronic conditions that result in constant pain and inflammation, and is highly comfortable and versatile. However, if you are rehabbing from an injury and need to prioritize support and protection, we would opt for a differernt type of ankle brace, such as a lace-up ankle brace or a brace with rigid bilateral hinges. In terms of lateral (side) ankle support, the Zamst A2-DX ankle brace is a step up from a lace-up ankle brace. It can be considered a hinged ankle brace, as the lateral supports are strong and rigid, but it's technically not a true hinge as the area the support connects to is not fully rigid itself. Nevertheless, this ankle brace provides superior lateral support, an anatomical fit, and overall not-too-bulky design, making it ideal for many sports including soccer. Zamst takes a lot of pride in this ankle brace, as they make sure to mention this ankle brace is worn by many basketball players in practice and games, including NBA star Stephen Curry. While basketball is obviously different than soccer, many of the specific features of this ankle brace are good for both sports. Overall, the Zamst A2-DX ankle brace is an excellent option for those looking to return to activity, but want something that will prevent them primarily from rolling their ankles inward or outward. This is one of the best ankle braces for basketball, volleyball, and soccer, and is also suitable for running. If you have a history of very mild ankle sprains, this may be a little bit of overkill for running in a straight line, but taking the mentality of "better safe than sorry" isn't a bad idea in any case. If you want the most lateral support possible while still being able to run, then we feel comfortable calling this one of the best ankle braces for soccer. The most common ankle injury in soccer is a l﻿﻿﻿ateral ankle sprain﻿﻿﻿. A sprain (with a "p", as opposed to a strain) refers to the stretching, damage, or rupture of a ligament. Ligaments are passive structures that connect one bone to another bone, and are therefore usually found crossing joints. So whenever you hear someone sprained their ankle, this means they damaged the ligaments somewhere around the ankle joint. One more thing, lateral refers to the side away from the mid-line of the body, so in this case lateral means the outside of the ankle, while medial would refer to the inside of the ankle. So why are lateral ankle sprains the most common? While the lateral sides of our ankles are strongly reinforced by numerous ligaments, it is also the most prone to being stretch. This is your typical rolled ankle. For example, let's say you slip off a sidewalk or curb and roll your ankle. As the foot rolls underneath your body, you are stretching the outside of the ankle, effectively acting to separate the bones on the outside of the foot and ankle. As these bones begin to separate beyond their normal capabilities, the ligaments connecting those bones are stretched, and potentially damaged. Medial ankle sprains are less common simply due to the fact that it's more difficult to naturally roll your ankle in that direction. Therefore, a medial ankle sprain would likely require an external force acting on the outside of your ankle, or even just a really awkward fall or accident. This would require a combination of eversion, which is rotating your toes away from the midline of your body (e.g. 2 o'clock instead of 12 o'clock), and dorsiflexion, which is bringing your toes up towards your leg. If you perform this movement, it may seem a bit more clear as to why it is less common for this injury to occur. So when can this be a common injury in soccer? Medial ankle sprains are usually contact injuries, whereby another object impact you, or you impacted the object, which then pushed your ankle into the undesirable position. Let's take a slide tackle as an example. If you plant your foot and another player aggressively slide tackles into your feet, and the bottom of their foot makes direct and forcible contact with the outside of your ankle, this could definitely result in a medial ankle sprain. You may have heard of a high ankle sprain before, and as the name suggests, this occurs higher up on the ankle. It's actually fairly interesting, although painful and very debilitating if you're a victim to this injury. The ankle ligaments connect the tibia to the fibula, so the foot is somewhat removed, yet the foot plays a significant roll in the development of the injury. High ankle sprains are usually a result of excessive torsion or rotation. You see it a lot in high-impact sports or contact sports, such as hockey and football. A common mechanism of injury in this case is having a foot planted on the ground while your body twists and bends backwards. For example, in football, a player may be tackled in a way where they are being pulled backwards with respect to their forward progress, but their foot doesn't slide out from the turf and they end up falling back on top of it. Tibia and fibula fractures are serious injuries that often require surgery. These types of injuries usually aren't isolated, but instead occur along with other injuries as well. For example, it's fairly common for someone who broke their ankle to also have a high ankle sprain. While these injuries can occur without contact, they usually require some form of external force contacting the ankle, often combined with an inability to move the ankle into a position that can accommodate these forces. The only broken tibia without a high ankle sprain that I have seen in soccer actually occurred in a fun recreational lunch-time game with co-workers. One of the players went to kick the ball at the same time the defender was trying to clear it and their legs connected, causing a clean break through the kicker's tibia. Stress fractures to bones in the foot and leg are somewhat common in sports that involve running, especially those that involve LOTS of running. Stress fractures are essentially tiny fractures that vary in length, but nevertheless are indicators of damage to the bone. Moreover, stress fractures can be quite painful and can limit your ability to run or even walk on that foot. Even though it's not that serious of an injury, stress fractures can be quite problematic, as they are often difficult to diagnose right off the bat. Sometimes an X-ray won't even pick it up, but that doesn't mean the bone is damaged, it just means that the bone is likely in the healing phase already. Usually, stress fractures can be healed with rest, but may also require immobilization, bracing, and some specific exercises to strengthen the muscles around the area. So while it isn't a devastating injury, stress fractures are very frustrating injuries, as they can keep you out of the game for a long time. Lastly, some studies suggest that female soccer players may be more susceptible to stress fractures than their male counterparts. This is most likely due to hormonal fluctuations resulting from altered menstrual cycles, or related issues. To learn more about the relationship between the menstrual cycle, eating habits, and bone health, please refer to t﻿﻿hefemaleathletetriad﻿﻿.org. Tendonitis is a chronic injury in that it usually takes a while to develop, and it also takes a while to heal, so it can be a really nagging injury. Tendonitis refers to inflammation of the tendon and causes and affected tendons can vary. In soccer, tendonitis in the Achilles tendon can develop from constant stops an starts during running, especially if you irritated or damaged the tendon in the past. As scar tissue develops, it makes the movement of the tendon less smooth over bone and other structures, which further damages and irritates the tendon, worsening the condition. Tendonitis can also occur from repetitive kicking motions, but this is usually in other tendons, not the Achilles tendon. Plantar fasciitis is somewhat similar to tendonitis, but involves a completely different structure. The plantar fascia is a thick, strong, tendinous structure that runs along the bottom of your foot from your heel to the balls of your feet and toes. If the plantar fascia becomes stretch or irritated over time, it can become inflamed and damaged to the extent that it causes significant pain and inability to run. Plantar fasciitis is very common in athletes participating in sports that require lots of running your bouncing on the feet. While there isn't one set way to develop plantar fasciitis, anything that places a higher amount of undue stress on the plantar fascia can lead to the condition. For example, individuals with high arches, weak or stiff lower leg muscles, or playing on a surface that places more stress on the bottoms of the feet, can all be things to predispose one to plantar fasciitis. How do ankle braces help with soccer injuries? A proper ankle brace can go a really long way in treating an ankle injury sustained while playing soccer. In a very basic sense, ankle braces limit your ankle from moving into the positions where these injuries occur. For example, an ankle brace with rigid bilateral hinges are great at helping to prevent medial and lateral ankle sprains because the hinges drastically reduce the range of motion in those directions. A lace-up ankle brace can function in a similar way, providing support and stability to all areas of the ankle, essentially tightening the ankle so it won't move beyond its limits. Given the fabric in these design is not rigid, they usually offer slightly less medial and lateral support than a rigid hinged ankle brace, but overall, they're really good. Most lace-up ankle braces can be worn under shoes as well, which makes them a great option for those recovering from ankle injuries that have progressed far enough along to be walking in a straight line. Ankle compression sleeves and socks typically don't do too much for preventing ankle sprains (they do help a little), but they are most optimally used when helping to treat chronic conditions like tendonitis and plantar fasciitis. You don't need to be an athlete to justify wearing one either, as they are highly effective for reducing pain and inflammation from chronic conditions, and can be worn on an everyday basis under any type of sock or shoes. Given all of this information about ankle injuries and different ankle braces for soccer, it is essential to obtain a proper diagnosis of your injury prior to deciding ​on which ankle brace to wear, as they all have different strengths and weaknesses. Once you have an idea of what you need, we hope our reviews will help guide you through the selection process. Lastly, always play it safe. Don't return to training before you are ready, and when you do, make sure that you are properly protected!